Another weekend wrap! This is becoming quite the habit. Friday was a fun day. 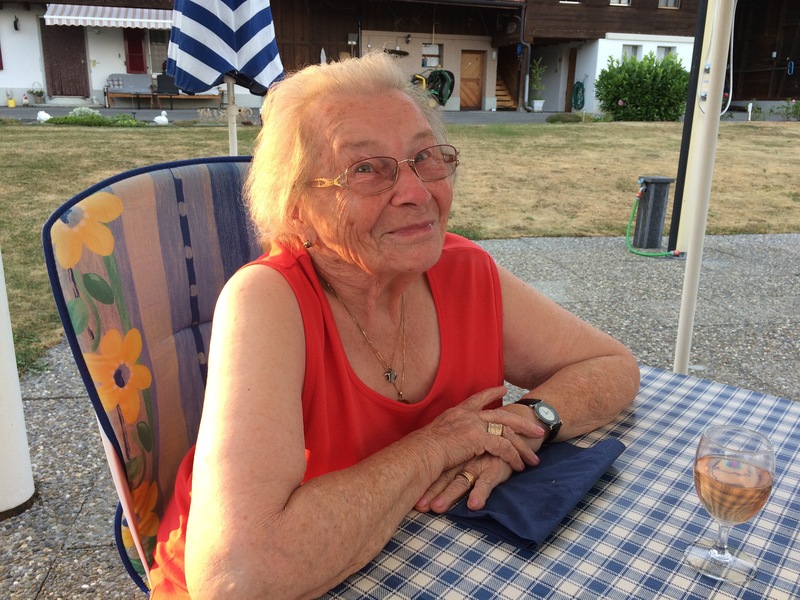 Liliane’s mum, Hertha, arrived early with Rene, who had gone to collect the lawnmower (which now runs like a Ferrari … touch wood) and picked her up on the way home. She is in such good shape, mentally and physically, it’s hard to believe she’s 91. Her wicked sense of humour also takes you by surprise sometimes! Liliane and I went grocery shopping together to a ginormous bulk centre called Growa. We spent an hour or so wandering around with a huge flat-tray trolley grabbing this and that – she bought beer, wine, meat and dog food etc, and I bought beer, feta cheese, spinach, filo pastry (can’t find it anywhere else anymore!) and dishwasher powder. Woo hoo, hold the phone, we went to town! 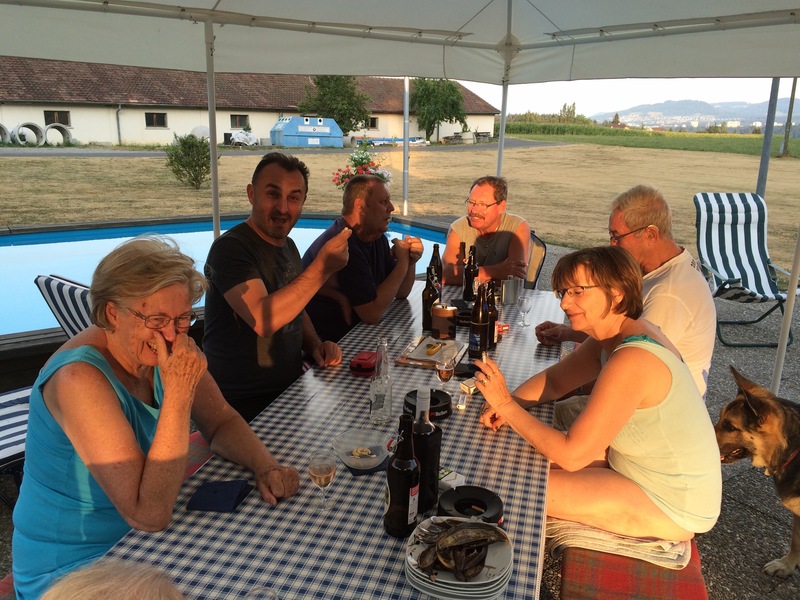 That afternoon Lotti, Fritz and Paul joined the five of us for dinner beside the pool. We played cards (I lost twice!) and had a huge barbecue. It was a late night but a fun one. Hertha said she really enjoyed it because Rene stayed the entire time. He’s feeling fit enough to socialise more which is great. Saturday morning it rained briefly for the first time in a very, very long time! At last! Leo went to work for a few hours so I did odds and ends around the house, and once the sun came out again, cleaned the pool, swam a bit and mooched a bit, then Liliane cooked dinner for us all again. We’re good at doing this ‘sleep and repeat’ kind of thing each weekend (although I’m glad we didn’t have another barbecue. It feels like we’ve done nothing but eat meat!). Later we played rummy and I didn’t lose. At last! Rene brought out some long thin cigars which are twisted/crooked like a small tree branch. I can’t find any pictures of them on the internet, and didn’t take any in the darkness, but we had a laugh smoking them. We could also hear, sporadically, music coming from the Gurten Festival on the little hill of Bern, about 20km away. And it rained again! We sat under the tent and enjoyed hearing and seeing rain again after less than 12 hours. Today, Liliane’s friend Lene arrived from Germany. Both she and Hertha will stay about three to four weeks so we’ll see them again when we come back from Sicily. Leo had an idea to go to the Rose Garden in Bern, but we both felt too slack. I had a swim and cooked dinner (Jamie Oliver’s spinach and feta filo pie with salad. I love it! Meat free at last!) and then finally at 9.15pm, dragged myself (no, not really) upstairs to write here. It was a great, hot weekend, with two bursts of much welcome rain. In other non-weekend news, I’ve been experimenting with Dr Bronner’s ’18-uses-for-one-bottle’ liquid soap as shampoo and body wash. It’s been about a month now, and I’m still unsure of the result. My hair feels like it’s coated in kind of a sticky wax, and the effect makes my hair look greasy/stringy. If it dries naturally, it sets into loose curls, but if I blow dry it, it feels like I’m amping up the waxiness even more. So the jury is still out. I need a haircut and am loathe to have it washed with their products, because it means I’ll be back to the drawing board again for this experiment. I’m kind of hoping after a few months, my hair gets used to not being washed in all those chemicals and silicone and so on. Maybe I can ask them to just wet it and then cut it like that? Dr Bronner’s soap comes in all sorts of smells and is available worldwide (I’ve linked to the American website, where you can see all their products). I was given lavender by Claudia when she and Dani came to visit last month. I’ve previously bought the baby/neutral smell and peppermint. I tried washing my hair with those ones too with similar results to now, but I gave up on the experiment after only a week or so, because I couldn’t cope with the sticky/clumpy feeling. Fingers crossed I can persevere and come out a winner. This is all part of a desire to cut down on the products I use and to be more aware of the ingredients of things. Half the contents of Nivea and other store-bought products are three words long and impossible to pronounce. It would be nice to be rid of stuff like that. Our skin is a big sponge and I’d rather it be soaking up natural goodies rather than chemical nasties. I’ve started putting things together in a carry-on suitcase for our trip. I was hoping to take a 22 litre backpack but I think that might be pushing it a bit. Not that I’m taking much! I’ll do a post about that on Friday, hopefully. Love the challenge of travelling light! that would be experiment ! It was brass monkeys here and aside from rehearsal and kids playing, Dean and I watched some episodes of Mrs Brown’s Boys. Good to have a laugh. 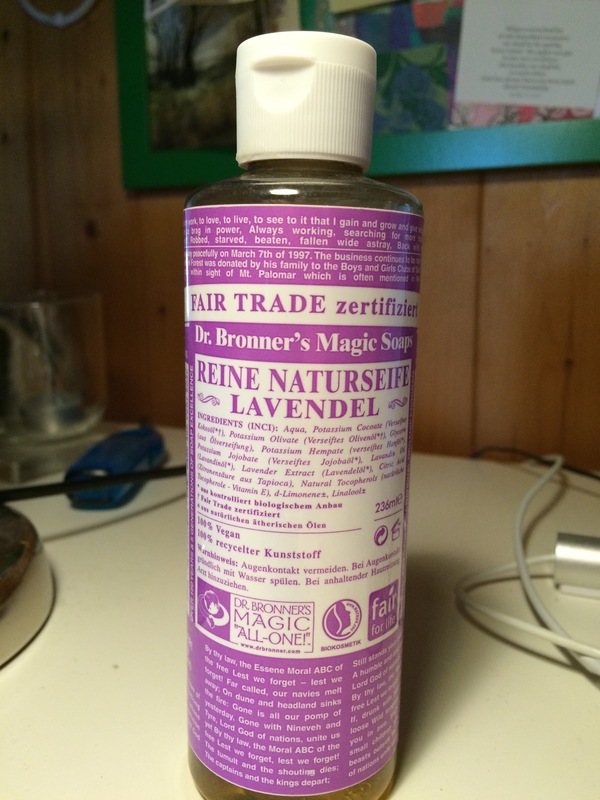 If you want to get a haircut, you could always take your Dr Bronners stuff with you and ask them to use that…. ?